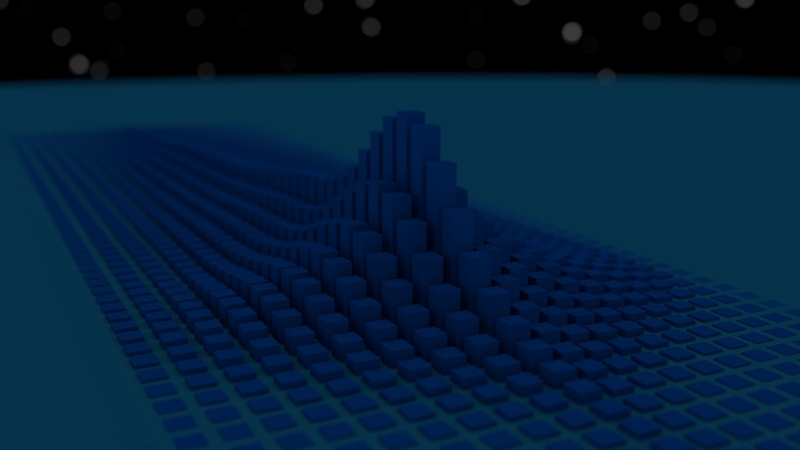 Topic : "3D Music Visualization - The Dissimulated Void"
Please post any feedback . It's nice. You could certainly go a lot further with a sound visualizer -- it's probably the simplest example I've seen for a while -- but it has some nice clean qualities to it. I'm not sure about the big flat expanse of ground colour though. What do you think would be best in place of a flat expanse? I was thinking some sort of colored rocks to make the DOF look better. I looked at Vertx's Tumblr and saw some amazing visualizations like the sphere. For another song, I'll experiment with ones as diverse as that. I couldn't find and music visualizations on Beeple's tumblr (Although I founder an infinite amount of amazing stills). I dont know that much about sound. I liked the areas in front of and behind the middle row, ramping up to the middle. On the usual 2D wave forms you just see the middle. Just watching a thing animate can get pretty boring if its a long song, so I suppose shifting the camera around helps, but makes it harder to view the vis. I liked the parts where you slowed down the camera movements. You answered the question about color shifting, I think you made the right choice.